Update: I’ve decided to alter the Base CrHe level of the spell and the spell complexity to better reflect the fact that the boat has a fair degree of complexity. Spell level is the same. One of my characters had a need to get across a moderate sized area of water with his companions, and it proved to be a little bit of an ungainly problem. Initially I wanted to create a boat and row across using Creo. It would have almost worked, except that we needed a longer boat ride than either Concentration would reliably allow, or that Diameter could provide. In the end our arts were stronger when each person was slowly moved with Rego magic across the surface of the water. It was a solution, and I’d like something more elegant. Create using Creo Herbam, or some other Form to suit the caster. Muto something into a boat, using an abundantly available material. So here are the effects, using a range of Forms. This spell conjures a small wooden boat, single sail, and running gear suitable for six travelers and their gear. The spell requires a finesse check to determine the quality of the boat*. * note: the degree of difficulty in that Finesse check is debatable. Set it wherever your troupe likes; I don’t want a can of worms based around a target number of 6 vs 9 vs 12. But what about when “You’re gonna need a bigger boat.“ A large boat, say a boat which is large enough to comfortably cruise the open ocean would be another size increase of +1 mag, resulting in a CrHe level 20 effect – perhaps called the Conjure the Dawn Treader or the Merchant’s Dream. At that size the skiff becomes something with multiple sails, a full crew, and capable of hauling many hundreds of tons of cargo. A spell I wrote up a long while back – Melt the Vanguard’s Arms is useful against one target. This is a quick modification to that spell to affect an entire Roman company of up to 100 soldiers. The spell guidelines in the first version used Target Part and an additional magnitude to affect multiple parts, however when affecting 100 targets the Target: Group makes more sense and would incorporate the needs of Target: Part. Ars Magica has a lot of scope for magical gear for Magi, but what about a useful mundane item? Is a switching circle possible? 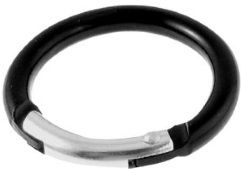 Its a carabiner device which can be used during the casting of circle or ring spells. Device is closed and locked, but can be opened as soon as an effect needs to be cancelled. The ring/circle breaks and the spell ends. The stability of the circle is far stronger or reliable than drawing the circle in something like salt, or scribbled with a stick. These could be designed into floors or carried in the caster’s palm so that they are portable (if the saga allows such things, portable circles are sometimes controversial). Flicking through the Ars Magica spells here and there, there are as many permutations and variations as a player could want. That said, I sometimes find it easier to review a complete variation of a spell for use with a character instead of considering it in my head. There is something more tangible when writing out the summary of terms and mechanics. This spell grants the target touched a +18 bonus to all wound recovery rolls made while the spell is in effect, and the target must stay within the circle/ring for the duration. Note that the spell will cause warping. This variant is intended for custos who require critical intervention and will not be moved. A variant spell for healing a group of critically injured people, with this version using the highest spell guideline from the core rules and reworked to last as long as needed. I can see this being used when an important character suffers a dire wound and they must be cared for straight away. An incapacitated character could be placed within the magic circle to ensure their rest and recovery is optimal. This post is inspired by those zombie and survival games and tv shows where a major part of the story thread revolves around keeping well fed. If a wizard in Ars Magica has vis they can conjure a great meal that will last forever, otherwise conjured food does not nourish in the medium to long term. Therefore here is an alternative – change the target so they can freely live from the land around them. The spell target can ingest and gain nourishment from all manner of materials which are normally only palatable and nourishing to animals, such as plants, raw meat, or even worms. This includes materials that would be eaten by avians, carnivores, and herbivores. While not as graceful or elegant as conjuring a bountiful feat, this solution it is better than starving. A Sun duration is required so that the materials can be fully processed before the spell ends. A quick aside – the name of the spell was chosen due to a suitable symmetry to Tantalus, and is part of the origin for the word tantalising. Tantalus was a son of Zeus, an ancient greek figure who stolen ambrosia from the gods and offered his own son to avoid punishment. He was tortured for eternity by lovely food just beyond his reach. The spell target can ingest base materials relating to the Terram Form, such as dirt, sand, and mud. Taking the idea to an illogical conclusion allows for consuming anything. This spell allows the target to consume any material, both living and non-living and gain sustenance from it. The volume of material required to sate the appetite should be proportional to the material consumed; with water offering almost no sustenance and animal and plant products offering near instant gratification. Material are also softened when consumed, so that even hard substances can be eaten. Casting requisites are mandatory when cast to suit the materials to be consumed. Adephagia is a greek goddess of gluttony. After the target has accepted the short term solution to their food dilemma, a kind Magus might offer a simple illusion to make the materials look, feel, and smell a little tastier. This next spell is an enhancement to the Taste of Spice and Herbs, from ArM p.145, so that the materials are far more palatable. The senses of sight and touch are as important as smell and taste when eating sand, worms, and the like. A setting’s worth of miscellaneous materials looks, tastes, smells, and feels like real food for a short time; exactly as the caster designates. Conversely some Magi may not be bothered by eating unusual materials, or enjoy the reaction of others when they do so. After reading all this I’m no longer hungry. More spells are listed in the new spells for Ars Magica page. High target numbers for Finesse checks frustrate me in Ars Magica, the required target numbers are borderline ridiculous for a typical wizard, and I see them as a game mechanic seeking to limit the use of certain styles of magic. They should be a way to add depth and risk to an activity, not punish players. It has some issues in the expanded game, when the Finesse rolls required are extrapolated upon in additional rulebooks, so that it may (depending on the troupe) have a very high finesse check to perform, and with that the risk of a total waste of vis if the Tower is malformed. And a somewhat troubling clean-up task too. I am an advocate of hand-waving away almost all those aspects given how infrequently the spell would be cast in a typical game, and how fundamental to a covenant’s growth the effect is. I stand by the point that Conjuring the Mystic Tower was never intended (when first written) to require a Finesse check of 24+. It is implausible for an NPC and frankly a waste of XP for a player character. For non-rituals, then sure roll Finesse – I accept that a little more. However any time a caster has the time to stop and plan the way an effect will be brought into being, then they should be able to greatly reduce their risk of failing that roll. Perhaps the guide should be a +1 to the Finesse check for each day the caster spends working on how the spell will be cast. If that approach isn’t punishing enough then use the pyramid scale from XP to require a massive amount of days to be spent to “buy” the finesse roll bonus.